Brush waffle maker with vegetable oil. Heat waffle maker. 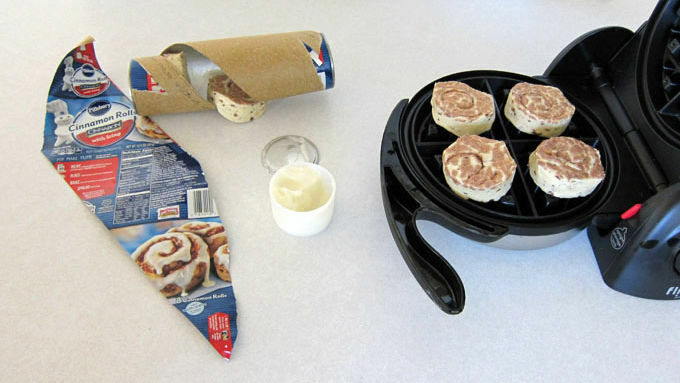 Unroll cinnamon rolls and remove icing tub. Place 4 cinnamon rolls in waffle maker. Bake for 1 1/2 to 2 minutes until baked through. (Time varies depending on waffle maker.) Remove and bake the remaining 4 cinnamon rolls. Split waffles into 2 layers. Cut marshmallows in half. 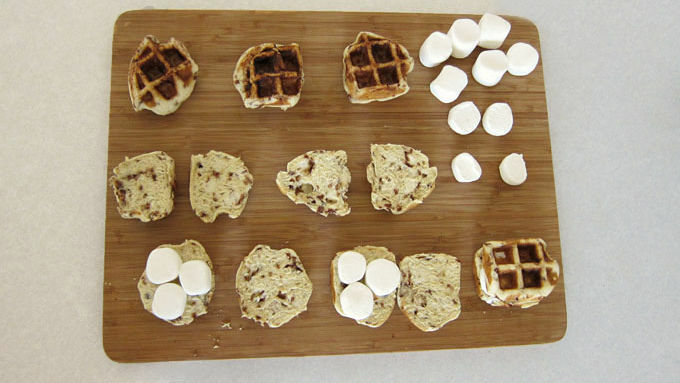 Set 3 marshmallow halves on 8 waffle halves. Set another waffle on top of the marshmallows, creating sandwiches. Put four waffles back in the waffle maker and heat for 10-20 seconds until the marshmallows just begin to melt. Remove and repeat with the other 4 waffles. Pour icing into a microwave safe bowl. Heat on high for 10 seconds. Stir until smooth then drizzle over the top of each waffle. To clean the marshmallow off your waffle maker, pour some water in the waffle maker and heat until the marshmallow melts off into the water. 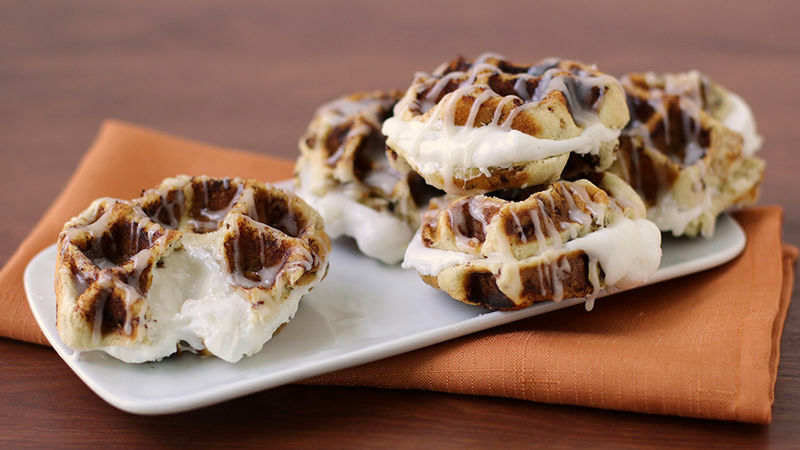 Pull out your waffle maker and get ready to make the most amazing cinnamon roll waffle sandwiches, filled with ooey gooey melted marshmallows and drizzled with sweet icing. This over-the-top dessert is super easy to make—you'll want to have them all the time! 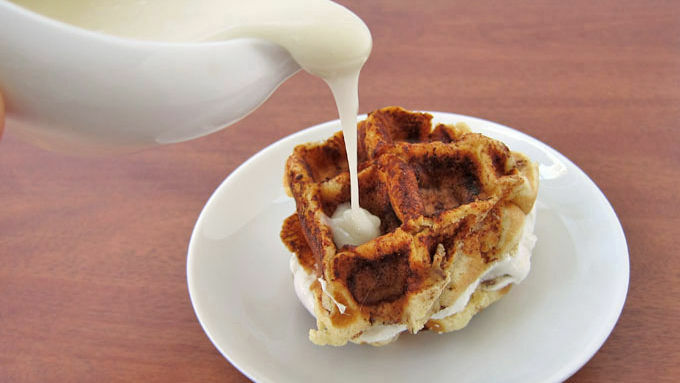 Serve while the waffles are warm and be ready to lick your fingers. 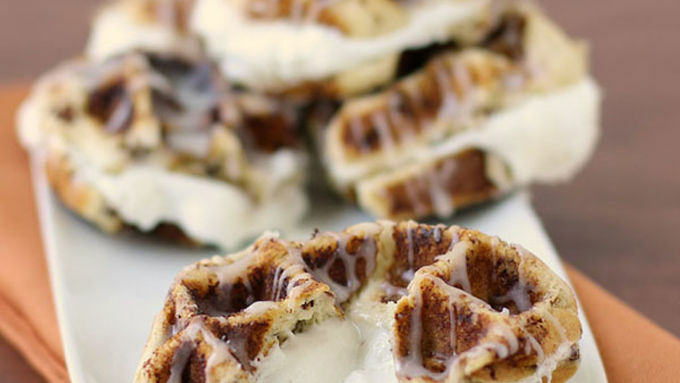 These waffle sandwiches might be a bit messy, but they’re totally worth it!